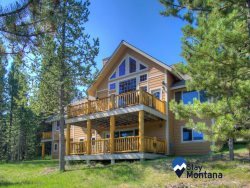 Our cozy condo offers updated finishes, stainless steel appliances, wood burning fireplace and an amazing meadow location. The condo is 10 minutes away from the biggest (and best) downhill skiing in the west and a few minutes from Big Sky town center. The living area is an open with vaulted ceilings and fully equipped kitchen to make a gourmet meal. There is one bedroom featuring a queen size bed and a loft (ladder access) with 2 twin beds. The condo community amenities include pool, hot tub and laundry. In the summer enjoy Yellowstone National Park, fly fishing in the blue ribbon trout streams, white water rafting, Arnold Palmer golf course, mountain biking, zip lining, hiking, or just chill in the mountains of southwest Montana. Don't miss the free concerts, farmer's markets, and weekly special events throughout the summer! Big Sky Resort "Americas Biggest Skiing", offers winter enthusiasts 5800 acres, 4,350 ft vertical drop, and average annual snowfall of 400 inches. Lone Peak, at 11,166 feet, offers challenging runs, iconic chutes, and magic carpets at the base offer kid-friendly beginner runs. - Gas Range,Coffee Maker, Coffee Grinder, Mixer, Toaster, Blender, Roasting Pan, Bakeware, 4 Place Settings, Basic Spices, Starter Starbucks Coffee, Trash Bags, Dish Soap, Dishwasher Soap, Sponge, and Paper Towels. - Olive B’s – A Continental Bistro! I worked with joe and he made the process seamless. We really enjoyed the fire place and how comfy the bed was. We had a wonderful time! The condo was perfect for 2 people. Location was fantastic. We would love to stay there again sometime! The place was great, exactly what we needed for a weekend. Its is a little small, but exactly as advertised and for 3 of us for a weekend. We never actually felt cramped or crowded. It was a great space in a great location for riding Big Sky all day, and relaxing in the evening.